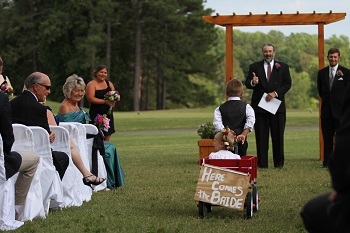 Hanover Golf Club is the perfect venue for all of life’s celebrations. Our banquet rooms can accommodate special events up to 160 people and our private rooms are perfect for informal family gatherings. Our Food & Beverage Manager will work with you during the entirety of your special event to ensure your expectations are exceeded. In addition, our talented chef and experienced wait staff work together to create a memorable event for your guests. 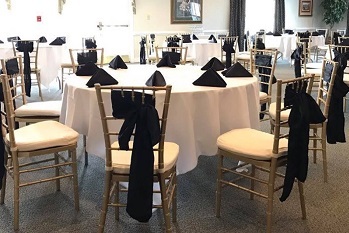 We offer several venue options at Hanover Golf Club, including our Main Banquet Room which overlooks the 3rd and 7th golf holes with evening sunset views of the 1st tee and 2nd green. The room can accommodate up to 160 guests and provides chivari seating and a covered patio for alfresco entertaining. This view is an ideal setting for a picturesque outdoor wedding. Our smaller private banquet room provides seating for up to 40 guests, ideal for an intimate dinner or small business meeting. With an eastern exposure, the view overlooks the 3rd hole, the swimming pool and the tennis courts. The Hanover Room is ideally located with a built-in bar, offering a warm club setting. Combined, all three rooms flow together beautifully to accommodate up to 200 guests for an hors d’oeuvres event. Find Hanover Golf Club on The Knot to add us to your favorite's.